Candidates playing to the base they have already established, getting them to cross over the line for support or keeping them from defecting, does indeed seem to be a rhinoceros. I know there was an interesting moment in the 2012 run-up where someone had said Ann Romney had never “worked”. Then there was a big debate over stay at home moms for about a week. That’s one of those moments I was thinking of….for women who took the survey in that week, that may have been at the forefront of their minds, and some of the data may be measuring their reaction to that. Every election their are dozens of moments like that, and we forget a lot of them. When looking back over the data though, it should at least be considered. An interesting wrinkle I just thought of….someone should be doing this during the primaries. 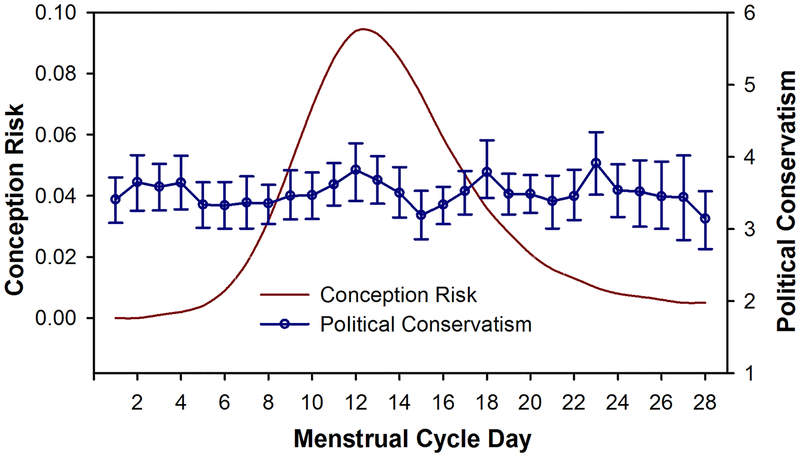 That might reveal some interesting patterns….do women truly get more conservative/liberal, or do they switch within party to different candidate personalities? The Hillary/Bernie thing might be the most revealing. If this is straight up about politics, it should be clear. If it’s confounded by personality or other candidate characteristics (like, say, gender), then that should be pretty easy to detect. I’d love to comment, but my knowledge of cyclical mood swings in females is nearly non-existent. What can a single guy do to learn about such things? The thought that is easiest to summarize–and most likely to cause people to turn on their skepticism about generic “election studies”–is in the second footnote. …around elections, pollsters are pretty obsessive about tracking things, and short of a major scandal breaking literally NOTHING causes a rapid 20 point swing. After spending a couple hours reading through a chunk of female cyclical mood swing research all I can say is “the night is dark and full of confounders”. I’m not sure I’d bother if I were you. On the other hand, there may be something to be gained from studying the male cyclical mood swing research. Since it appears men fluctuate daily, it would be interesting to see if similar research done on men at different times of day yielded a swing in preference. Then you could figure out what you felt best about and time your showing at the polls accordingly.